I’ve been a lot places across the globe and many of those places haven’t been the sort that one goes to for a vacation. Frankly, many of them have been quite horrific by the gentrified standards of the West. Hence, I see things that others miss – such as the actual state policing in the ghettos. Periodically and with growing frequency Americans are beset by complaints and rantings from Liberals, Progressives, and Blacktivists about how the police operate in the various and normally crime-ridden Black-controlled municipalities. Such jabberings shouldn’t be given the handout of too much credence but they should be listened to and processed because they’re part of the situation and help fuel the problem. Yes, there are some behaviors on the part of the police that in the context of normal civilian law enforcement can be described as excessive. Similarly, there are policies in place by law enforcement that in the context of normal civilian policing seem a bit draconian. However, that is all inherently in the context of normal civilian situations and do not believe that context is truly applicable to the ghettos. I can’t really see anything more than superficial differences and differences of magnitude – for now – between what our soldiers have gone through when they had boots on the ground in places like Fallujah or Lashkar Gah and what the police go through when they have boots on the ground in places like Ferguson and Compton. And the law enforcement policies and the behaviors of the police are similar too to those of soldiers in such benighted places. True, there’s a happy dearth – so far – of snipers in the ghetto and a total absence – again, so far – of IEDs and roadside bombs in the ghettos. There is, however, other forms and levels of threat to the police and there is the same sort of hate-filled indigenous populations who are uncooperative to the extreme and who view the police as enemy occupiers, enforcing foreign law and control over their lands. And, just like Fallujah or Lashkar Gah, there’s always the credible threat of mass violence lurking just under the surface, ready to hit flashpoint without even a moment’s notice. 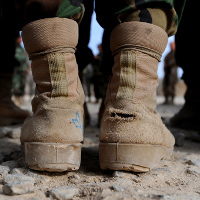 Yes, it’s sad to say but boots on the ground are boots on the ground and there’s no intrinsic difference to the situations based solely upon national borders and which uniforms the men and women wear. The same measures need to be taken; the same mistakes will be made; and the same attitudes will grow and fester. This entry was posted on Thursday, September 3rd, 2015 at 12:12 pm and is filed under Politics, Society. You can leave a response, or trackback from your own site.